Model-30" Dia. to 60" Dia. Fluidpack supplies Accura cGMP Tablet Coating Machines to facilitate the tablet coating process used for film and sugar coating of pills. The machine comes in 5 variants- ACM-30, ACM-36, ACM-42, ACM-48, and ACM-60 allowing other dimensions to be used as well. Provision for 72” is also available within the machine. 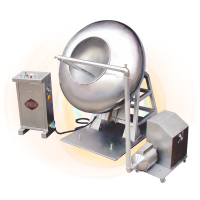 The machine consists of a coating pan in order to give a flawless coating. The machine structure is built with SS Square tubes and the base plate with MS cladded with SS giving it a robust structure, making it corrosion free thus giving the machine a long life. The machine is very easy to operate and maintain making it user-friendly. The machine is having study structure of square SS square pipes. Base plate is of MS having SS cladding. It is very much easy for cleaning. Electric motor & Gear box are directly coupled. Coating pan is mounted directly on Gear box shaft, having convenient mounting angle of 300. Coating Pan is designed to give quality coating of Tablets. Fixed Baffles are provided in coating pan (optionally) to facilitate the tablet mixing during the coating operation which helps in achieving uniform tablet finish. Separate hot air blower unit of adequate heating element is provided with temperature controller. For main motor drive AC variable frequency drive is provided with the machine. The MACHINE is having separate Electric control panel. 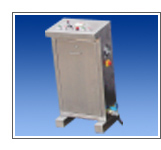 Separate polishing pan also can be provided.